Coming rather late to the horror-genre (a couple of exceptions notwithstanding), I never saw “Candyman” when it hit the theatre – or the TV-screen – before. 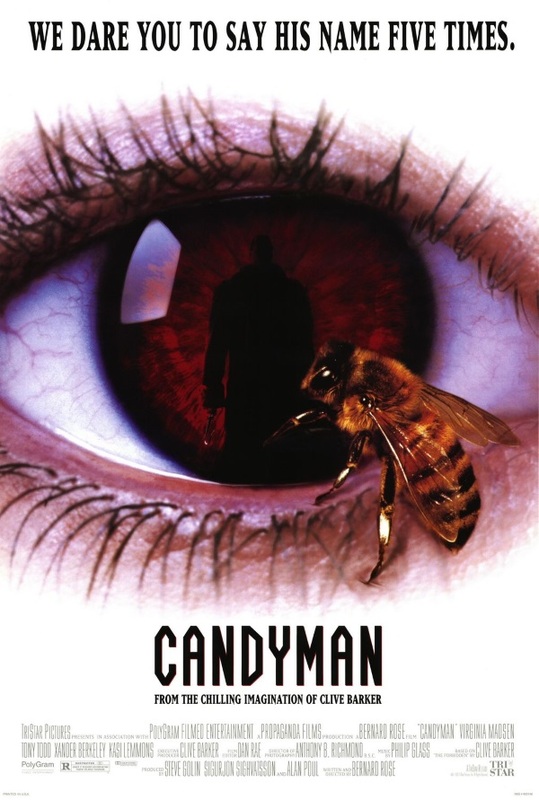 However, I remember seeing either a review about it or the trailer on TV, since the underlying concept of saying Candyman into the mirror five times (something that my friend Maynard actually was brave enough to do) and then dying a horrible death, definitely stuck with me. Despite that, I never got a good opportunity or developed sufficient interest to watch it. With the /slash Filmfestival showing it on the big screen, I now finally got my chance – and thought that it was ok. This is probably one of these films that you have to see when they’re fresh. While I wouldn’t say that much has been spoiled to me, it nevertheless seems like a product of its times, at least up to a certain point. Actually, one of my favorite things about the movie is the depiction of the projects (who also featured heavily into the groundbreaking tv-show “The Wire”), and how it deals with matters of race. I also think that Helen Lyle was a strong main protagonist (which reminded me a lot of Dana Scully; not just her looks, but also the fact that a sceptic is thrown into this supernatural plot, trying to deal with it), played rather well by Virginia Madsen. Also, Tony Todd, with his booming voice and his commanding presence, was a great choice for the villain. The movie’s shot rather nicely, and for the most part features a nice, eerie atmosphere. There also are a couple of great, disturbing scenes that will stick with me for a while (the bees!). The score by Philip Glass is quite unique, and feeds into the impression that something here’s off somehow. And the ending, while rather clichéd and forseeable, at least comes with a nice little twist that caught me off-guard. However, I found the whole story of the movie, and the way the plot develops, rather strange. Maybe it’s because I’ve known the general backstory (Candyman, mirror, saying his name 5 times) for so long, but I kinda expected a totally different movie, and I’m torn between being glad that the movie managed to surprise me like that and disappointed because it didn’t really seem to stick with this concept that sounded rather neat. It’s further hurt by the fact that it doesn’t really stick to its own rules, or at least neglects to tell us what those really are. Most of the jump scares were also quite cheap, with very loud sound effects, sometimes coming totally out of the blue, without any buildup. Finally, like with most movies, I again would have preferred a down-to-earth explanation; especially in this case, since it the one that they came up with actually was really clever, neat, and well thought-out, with the empty space behind the mirror. I’m already predisposed to grounded resolutions anyway, and when you then present one that I fall in love with right away, it’s a little disheartening when you don’t stick with it, but turn back to the supernatural instead (even though in this case, I already knew that it had to happen, so at least it didn’t come as a shock). Overall, I’m glad that I’ve finally seen it, but it’s probably not a movie that I’ll revisit anytime soon. This entry was posted in /slash, movie reviews and tagged /slash, /slash 2015, Bernard Rose, Candyman, horror, Kasi Lemmons, Tony Todd, USA, Vanessa Williams, Virginia Madsen, Xander Berkeley. Bookmark the permalink.